All teams have strengthened their squad after Auctions of IPL 2019. Many wonderful Auctions held in the IPL 2019 Auction. So finally when we have the list of all players of all teams, we will check most possible IPL 2019 Openers of All Teams. In this blog, you will get the name of all those players who are going to be openers of each team, also the name of the backup openers in the tournament. 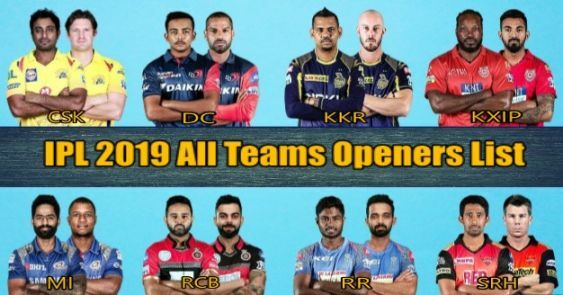 Check below the list of IPL 2019 Openers of All Teams. In the list of IPL 2019 Openers of All Teams talking about the Mumbai Indians team, the first choice is Rohit Sharma who will also be leading the team and other one is Quinton de Kock. So these two will be the proper opener of Mumbai Indians in IPL 2019. So for the first pair, there is no doubt Rohit Sharma definitely will be for sure. As a back opener, Mumbai Indians has Evan Lewis and Ishan Kishan. So they have some bunch of players for opening and middle orders. That means we see some good cricket by Mumbai Indians in IPL 2019 again. A few names who can be openers of KKR in IPL 2019. The first pair as the proper opener of KKR is coming as Sunil Narine and Chris Lynn. If you take a look on backup openers then KKR have Shubham Gill, Robin Uthappa. These four players will be the part of Playing XI for sure. If Sunil Narine and Chris Lynn will open the inning then Uthappa and Gill will play in middle order. So one pair out of these four will be the opener of Kolkata Knight Riders in IPL 2019. First, take a look at the Royal Challengers Bangalore team. RCB has two primary openers, Virat Kohli and Parthiv Patel. Virat Kohli will be opening the inning for sure in IPL 2019. As a backup opener, RCB has Heinrich Klaasen who is from South Africa and he is also a strong backup opener. So we will see him in the middle overs as a good batsman. Looking at the Chennai Super Kings team, there are 5 players who can come as an opener in IPL 2019. The proper openers of CSK are Ambati Rayudu and Shane Watson. Other backup Openers of CSK can be Faf du Plessis, Sam Billings, and Murli Vijay. Taking a look at Kings XI Punjab team, primary openers of KXIP will be Chris Gayle and KL Rahul. They were the opener of Kings XI Punjab last year also and they will be opening the inning this year too. These two are one of the best openers in IPL 2019. Karun Nair and Mayank Agarwal are also available as backup openers in IPL 2019 for KXIP. Looking at Mayank Agarwal's current form, he turns out to be a good option for the opening. The primary openers or DC will be Prithvi Shaw and Shikhar Dhawan. Dhawan is a good opener in Indian Cricket team and he was traded from SRHto DC. So Dhawan will be one of the openers of DC team in IPL 2019. Hanuman Vihari and Shreyas Iyer will be as a back up the opener in IPL 2019. Shreyas Iyer will also be leading the teams and we can watch him play in Middle order also. Rahul Tripathi and Ajiknya Rahane can be the opener of RR in IPL 2019. Rahul Tripathi has already played as an opener for Rising Pune Supergiants. As a backup opener, they have Manan Vohra and Jos Buttler. So these two can also play a role of the opener for KXIP in IPL 2019. Finally, If we take a look at Sunrisers Hyderabad team, the two primary openers are Wriddhiman Saha and David Warner. As Shikhar Dhawan has already been traded to Delhi Capitals otherwise he used to the first choice as an opener, so that will affect the opening order of SRH. They have back openers are available as Kane Williamson and Martin Guptill. Which team has the Strongest Openers?